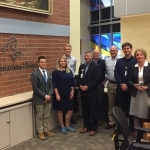 KFF NYC office director Neila Baumiliene met with four Lithuanian Emergency Medicine Residents who are currently acquiring knowledge and experience from world's top Emergency Medicine specialists at the University of Cincinnati and Tri Health Good Samaritan Hospital. Young promising Lithuanian Emergency Medicine doctors, Martynas Gedminas, Renata Androsaite, Aleksandras Briedis and Martynas Banys are four more participants of a seven step program to expose 24 Lithuanian Physicians training in the specialty of Emergency Medicine about how to manage and direct Emergency Medicine Departments in community hospitals. 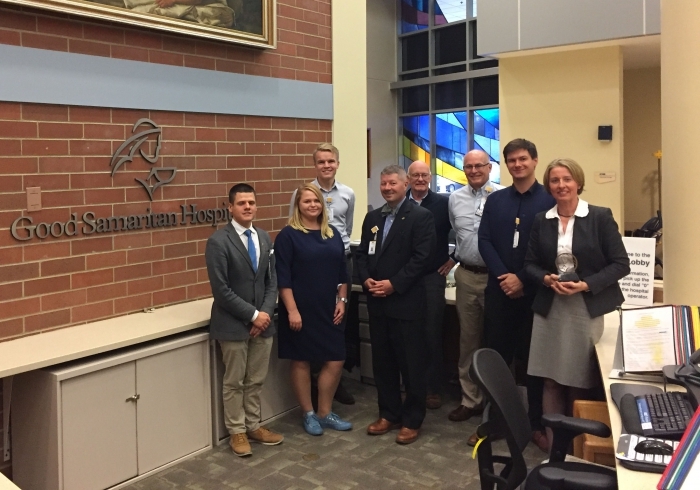 Lithuanian doctors joined Emergency medicine doctor Herb Loyd, head of Emergency medicine at Cincinnati hospital Kurt Knochel, Tri Health Good Samaritan Hospital Administrator Jamie Easterling and their incredible teams of experts for 5 weeks. During the visit Neila Baumiliene was introduced to residents' daily schedule, met with many specialists who devote their time and expertise to training Lithuanian doctors, observed residents' presentations on their current special projects and the success/positive impacts of prior resident's work. N. Baumiliene together with a team of ER doctors also participated in a discussion based on the residents' projects at the home of Stewart Wright, Co-Director of Emergency Medicine Global Health Team of UC. Stewart Wright, MD and his assistant Grace Lagasse, MD both participated in the ER Conference in Kaunas in April of 2018.